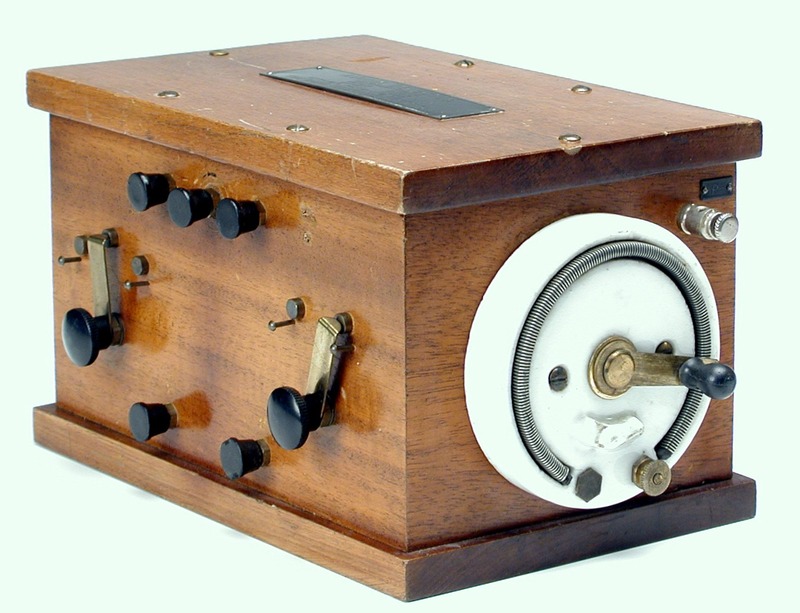 The first RJ4 detector box was built by the de Forest factory in 1913. RJ meant “Radio Junior” and was sold only to amateur radio operators and for experimental use. It appears to be a copy of the Wallace Valve Detector which had been sold since 1911. The RJ4 was not a complete receiver, but just a box to hold the A & B batteries for the tube and switch taps to set the proper voltages. The tube, either a tubular audion, or later a spherical audion, was mounted on the front of the box. The box and a tube were sold together. The tube output was connected to a set of headphones. Used with the RJ4 detector box would have been a tuner like a ‘loose coupler,’ connected to an antenna, and a set of earphones. The second version of the RJ4 came out in early 1914. This is the version in The Perham Collection. The filament rheostat was moved to the right-hand side and the switches were built in. A later version had a tube socket for a spherical audion, and was called the “Improved Type RJ4 Detector.” In 1916 de Forest came out with the RJ-9, which was a panel only and sold for a lower price. By this time, de Forest himself had already sold most of his patent rights.